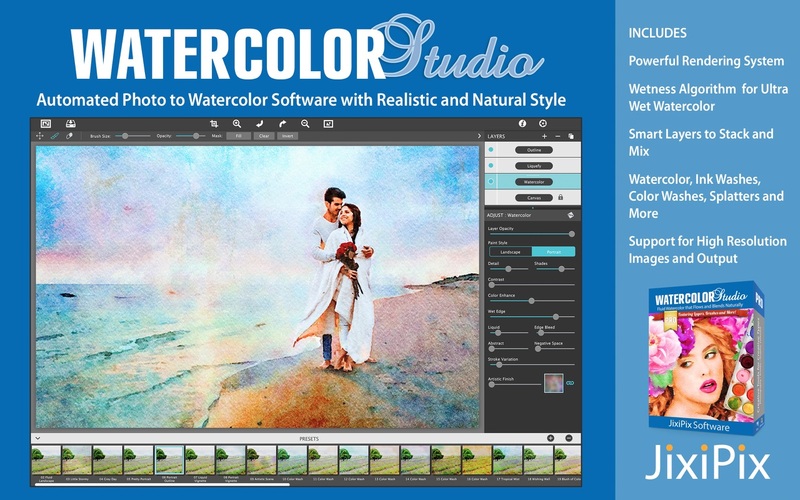 Watercolor Studio Pro 1.4.0 – Automated photo to watercolor software. Paint Layers allows you to create beautiful and unique watercolors by stacking watercolor layers, blending color washes and texture, and brushing in details. No artistic skill needed! Every photo placed in Watercolor Studio is automatically transformed into a watercolor with full control over settings. While it’s great to have complete control over what the paint does on the paper, some of the most beautiful effects occur in the experiment process. So have fun and try not to be too careful. You will be amazed at some of the paintings you will get. Artistic Edges, Taped Edge, and Custom Edges were added to the Canvas Layer. Next story WonderPen 1.5.2 – Writing app for both professional and amateur writers. Previous story Cloud Outliner Pro 2.5.3 – Create and share outlines between Apple devices and Evernote accounts. DxO PhotoLab 2.1.1.17 – Image enhancement for RAW and JPEG files. JixiPix Watercolor Studio Pro 1.30 – Automated photo to watercolor software.